Those are terrific! I actually like the 2nd one even better. If you want feedback on that scene, I’d say first not to change too much, because it looks great as it is. I don’t think it’s too dark. 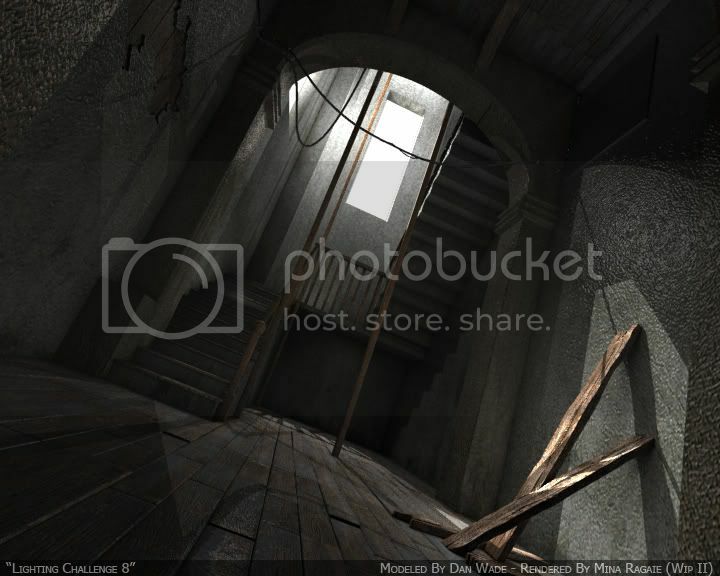 You might add a bit more definition to the stairs in the upper right, they are a flat gray, and when I first looked at the image I was wondering what the blocky 2D squares were covering part of the window. 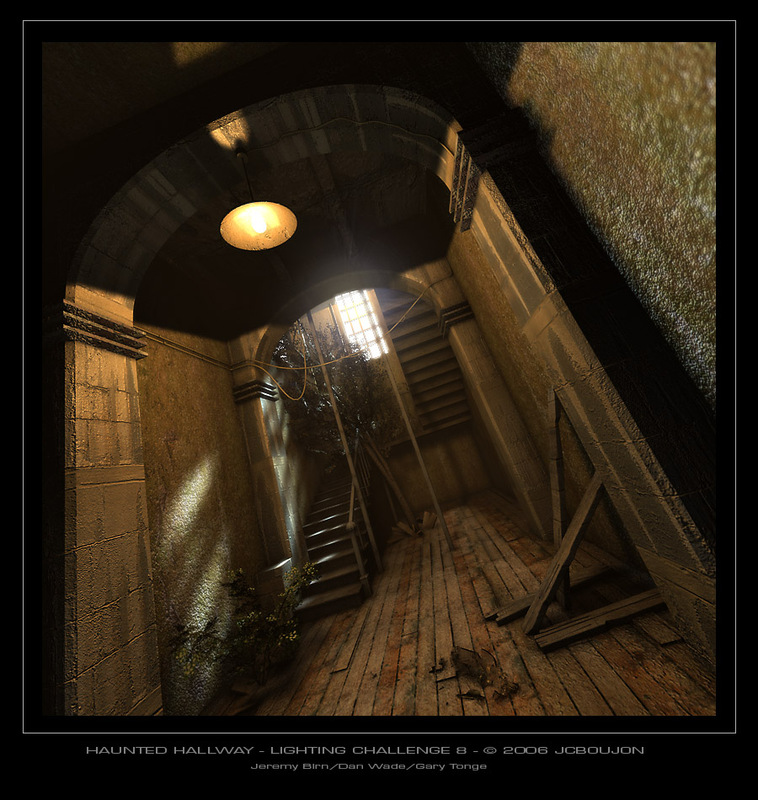 If the stairs in the upper right of the frame just had a little bit of rim or specular along the edges that face the light bulb, it might define them better in 3D and help add to the sense of a space closing in around us too. The lightbulb looks good, but maybe in Photoshop you could add little more glow around it, maybe just extending a few pixels outside of it? Also, the archway closest to the stairs looks a little strange, the shadow it casts on the wall looks as if the bottom of the archway doesn’t fully connect to the top arch, and then the top arch stays bright all the way up to where it meets the ceiling above it, where it might look better if it either faded away or else continued out of frame with the same texture? Thank you to give us that great feedback Jeremy. I think it should be better now ??? Comments and critics are welcome, as always ! how much time do I have to finish this challenge? I was wondering how much time do I have before the next challenge starts? akwavox - fantastic work. I like seeing the breakdown. Did you render this out in one pass or did you do separate passes? MinaRagaie - Very nice work. So the bottom image is what you want for the lighting? It looks to me like the left wall and floor might getting lit by an extra light. Excluding them from that one might do the trick. Also, the specularity on the wall seems much too high. On the other hand, it also could just be that you lost some falloff in the textured version. Here is my first attempt. 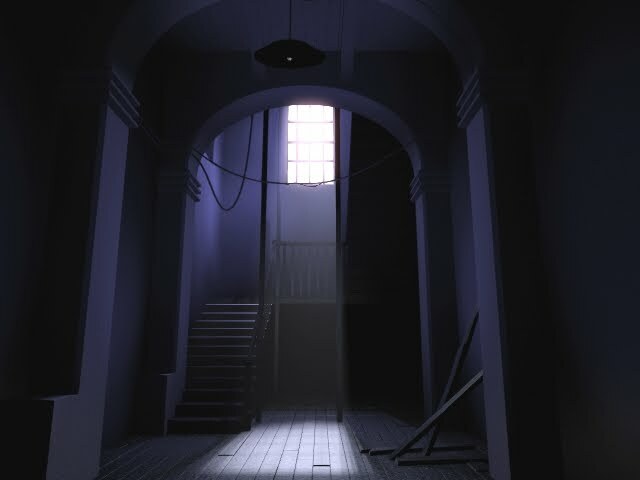 Lots still to do - like put some bounce lighting, better illuminate the staircase etc. Sort out the volumetrics and better position the main light/shadow. shoox - Welcome! Keep going with the scene. zildjian - Good start. See if you can improve the definition of the dark areas, maybe with some rims and kicks? The brick texture on the back wall looks strange, as if it just cuts off and turns into a green surface. MinaRagaie - Probably the next challenge will go online about 160 hours from now, so you have time. Too early to say anything about the top one. Bottom one is nice but needs some work in the window area, so it looks like light is coming in instead of having dark window frames, and maybe a background image or window slats or some glass or something. akwavox - Thanks for sharing! 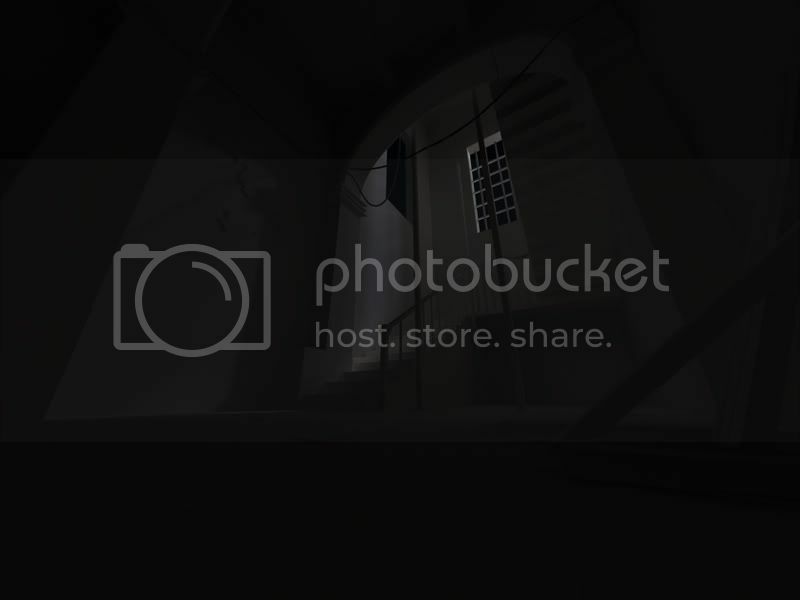 That image 4, the volumetrics, looks really cool and spooky. 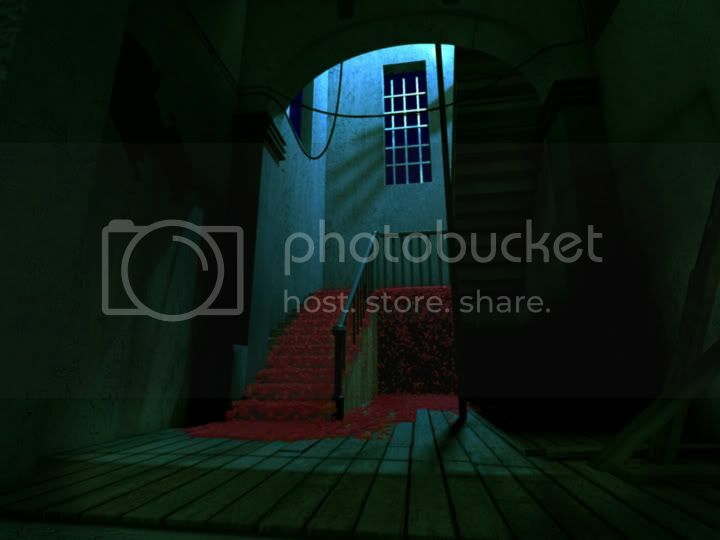 I wonder what your scene would look like if you made the floor much darker and let us see more of that spooky stuff? You still might consider some definition in the upper right of the image, maybe a rim along the edges of those steps to define them better? … Did you render this out in one pass or did you do separate passes? I did it in one passe. 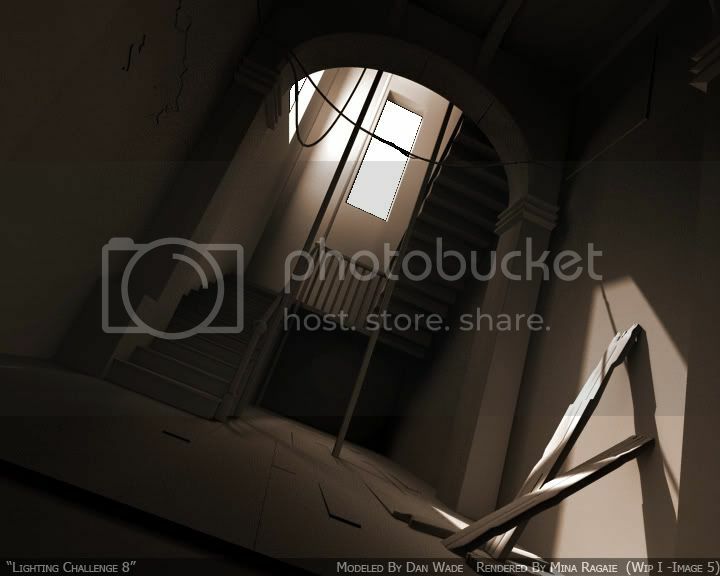 I just need the pass of the volumetric main light, to make it brighter in post-prod. 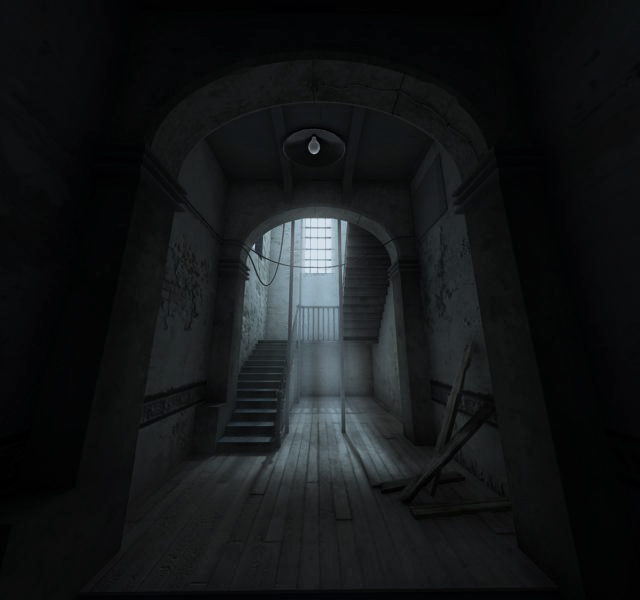 …I wonder what your scene would look like if you made the floor much darker and let us see more of that spooky stuff? Yup, i tested it !!! I think the effect of that spooky light could be better with another main lightning, considering that cam angle… ?? With a main light not so direct to the floor, something like candle lights between colomns for example. The spooky effect should have more “relief” that way i think… ?? …You still might consider some definition in the upper right of the image, maybe a rim along the edges of those steps to define them better? If i found some time, i will work on it. like my first attempt. I’m going to try another better picture ! Here is my new picture with the corrections. Hi, I’m a little late, but I just thought I’d post a quick WIP shot of my lighting. Rendered in Lightwave using lots of spotlights. prokiller - Welcome! That’s a nice start, it’ll look like blood if you can get all the little balls to melt into eachother more smoothly, I guess? Well, you succeeded in making a copy. Now, what else can you do? eldonaldo - That’s a nice scene! I can’t help feeling that the windows need something – maybe some glass, maybe a background image or something outside? djmj - Well, that’s certainly very bright. It seems as if softer shadows, especially from the lightbulb, would add a lot to it. JCBug - I love it! BsBs - Great scene! I like the interior/exterior color difference. Chrisdc - Good start! It looks a bit uniform and symmetrical now, maybe some darker areas could help break it up a bit? I use a syntax “-sh” (Shadows from direct lighting are recomputed.) But If iam just gonna use Radiosity on shadows, then I need microscopic polygons…Maybe thats possible. Insted of spamming this board, I can update this post insted. Max9, mentalray3.5. FG only. The Fairy dust in post in PS. I am late… Actually I have finished this image 2 weeks already, but I could’t post it due to the internet connection problem here. And is already ok here. Thanks for all the c&c. Here it is… It doesn’t look really horry, because I actually want to practice my lighting skills without GI… I am going to make another version of it and I will try to make it stick to the topic… Thanks jeremy’s Lighting & Rendering, really helps me alot. Hoppergrass - Good start. The fairy dust doesn’t really work for me, maybe instead of that 2D effect you could make it be more like little lights that actually illuminated things and reflected? 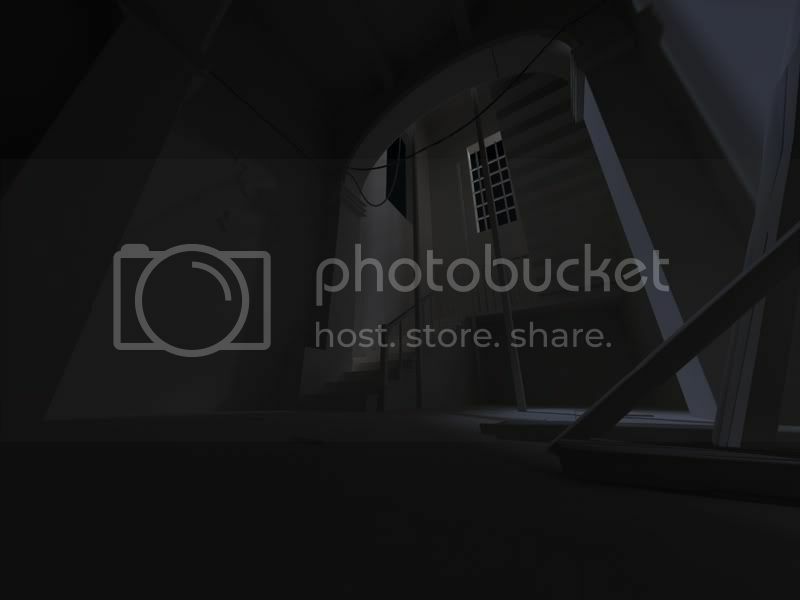 Maybe some of the corners could be darkened down a bit, with more a sense of the dust lighting things? Liumiao19820823 - Welcome (I bet I can guess your age and your birthday from that username… ) Good start! It looks evenly lit and flat right now, maybe you can get more occlusion and shadows or make the light decay with distance more?